As optometrists we can detect many diseases before symptoms arise, leading your primary care physician to early treatment. Diabetic retinopathy is a complication of diabetes in which causes abnormalities in the tiny blood vessels nourishing the retina. 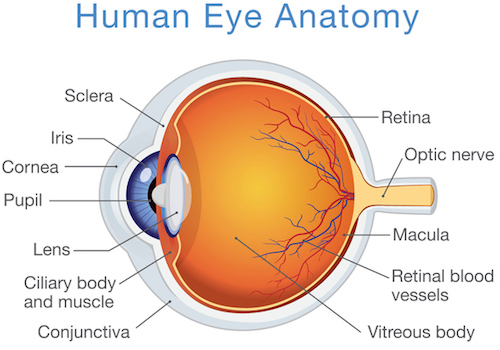 These vessels weaken, leak fluid and blood, and fail to provide nutrients necessary for good health in the retina. Left untreated, diabetic retinopathy can result in severe visual loss, including blindness. Click here to learn more diabetes. The eye is the only organ where the blood vessels can be observed directly making the eye an easy place to find vascular disease. If the vessels in the retina are changing, the vessels in the rest of the body are suffering as well. With Hypertensive Retinopathy the patient may notice blurred vision and think they need new glasses, when in fact glasses will not help them. Close management with a Primary Care Physician and Optometrist are necessary, managing medications with a primary care physician can help with keep your eyes at their best. This patient was seen for a complete eye health exam and it was noted that there were some mild hypertensive changes to the vessels of the eye. Three months later the patient returned with blurred vision. Upon closer inspection, one of the retinal vessels was blocked resulting in blood found in the retina (red smears) and cotton wool spots (white spots) from lack of oxygen. Multiple sclerosis (MS) is a neurodegenerative disease of the central nervous system. Many of the tests performed at the complete eye health exam my seem silly, they are actually important neurological tests! Up to 20% of patients have optic neuritis as the initial clinical presentation of MS. With symptoms including painful vision loss that occurs over hours to days and lasts a few weeks, blurred vision, pain moving the eyes, diminished color vision, blind spots, abnormal pupils and optic disc swelling. Like high blood pressure, viewing the vessels of the retina allows your Optometrist to see other systemic complications. When there is a build up of cholesterol in the bloodstream it forms sticky spots called plaques. Large plaques are concerning, as they can block arteries. When arteries are blocked in the brain, we call this a stroke; in the heart it is a heart attack. In the eye, this causes blind spots. Managing medications with a primary care physician can help with early detection of arterial plaques. Autoimmune disorders can have devastating systemic and ocular effects. Symptoms may include dry or red eyes, foreign-body sensation, light sensitivity, pain, visual changes, and even complete loss of vision. Because a number of these diseases may initially present with ocular symptoms, a thorough complete eye health exam should be performed.